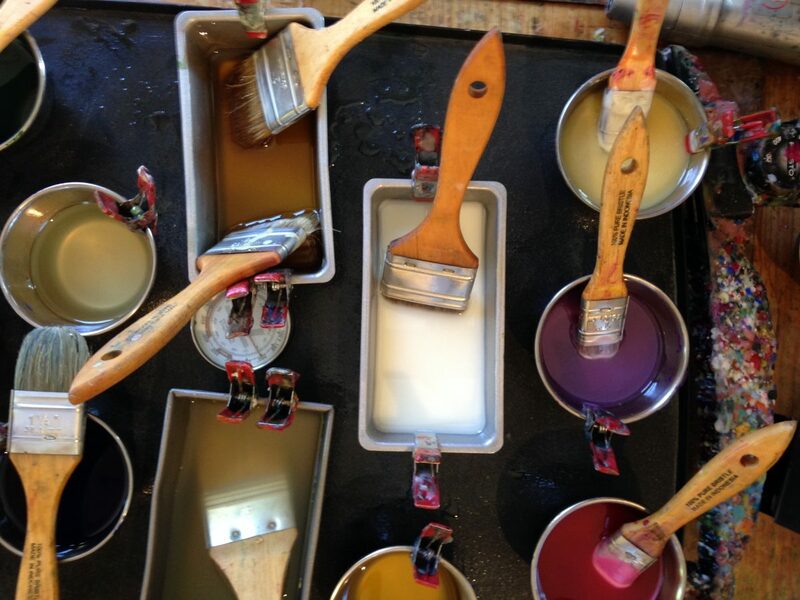 Before you begin to paint with encaustic, you’ll need to pick-up encaustic art supplies and set-up a studio space. Once you have all the supplies you need in-hand, come back here to learn how to paint with encaustic. Start with a suitable substrate, you may wish to read about choosing and preparing substrates before you continue…. Before you begin to paint you may wish to use painter’s tape to cover the sides of your panel. When you’re finished the piece you can remove the tape and decide how to further finish the edges of your painting. If you wish to paint on a white ground you can purchase Encausticbord or prepare your substrate with encaustic gesso or chalk paint. This is optional, it is perfectly acceptable to paint with encaustic directly on an unprimed panel or board. 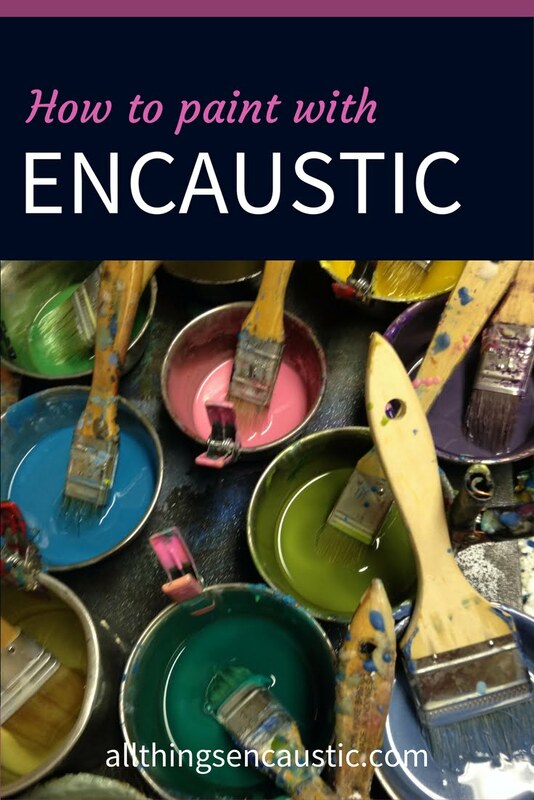 Encaustic medium is made from beeswax and damar resin. 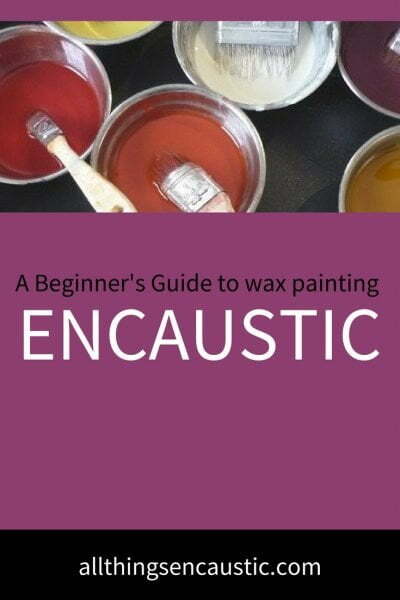 You can read here about how to make your own encaustic medium or you can purchase ready-made encaustic medium. Some artists mix all of their colours directly on the griddle, while others use metal tins. I have done both but I usually use containers. I use a pancake griddle filled with small metal pots. I melt encaustic medium in these tins and then add oil paints for colour. You can also purchase pigmented medium. Choose natural hair brushes (hake or hog bristle brushes) for encaustic, synthetic brushes will melt. You need to not only heat the wax but you also need a hot brush. Leave your brushes in the pots of coloured wax as you paint and they will stay warm enough. Now to start painting! Brush a layer of melted medium onto the substrate. Encaustic wax is applied to a painting in layers, and each layer is fused. Fusing as you work simply means to apply heat to allow each layer to soften enough in order to merge with the previous layers. Fusing provides bonding between layers and overall stability. You need to fuse the first layer of wax to the substrate and then each subsequent layer needs to be fused to the layer below. There are a variety of encaustic fusing tools used by artists working in encaustic including the heat gun, blow torch, embossing heat gun, Encaustic iron, and stylus. Heat lamps can also be used. Different effects can be achieved with the different fusing tools. Encaustic is a very versatile medium. There are seemingly endless possibilities for creating art. Here are a few other techniques to explore now that you understand the basic process. Beeswax works very well with mixed media. The wax will hold absorbent collage elements in place. Want to learn more about how to paint with encaustic? Subscribe to my mailing list so you don’t miss a blog post. You can also follow the All Things Encaustic Facebook page. Thank you for this article! I have wanted to try this medium for a while, but the process seemed so mysterious! Now I feel I can give encaustic painting a try! You’re welcome Faith I’m glad that this post helped you. I recommend finding a workshop. It’s a great way to try it out before you purchase all the tools and supplies. I would like find a discussion group where I can share/ask etc with other encaustic artists. Any suggestions? I looked at Pinterest but that seems mostly about sharing work, rather than technique or product questions. I tend to paint with a brush onto layers of fused wax. I believe this would be considered a cold wax process. I find that these two products are very different in how well they “flow” off the brush as well as how they fuse, especially to each other. I add a equal amount of encaustiko’s XD by weight to the wax sticks and that works well for my process. The encaustic arts wax blocks contains no damar resin and it seems better designed for hot wax processes. Am trying to adapt the wax blocks to my process (horror of horrors! ), having invested in quite a few colors (and they have great colors – including neons). There are a lot of great groups on Facebook. Here are a few. I use the Encaustic Arts wax blocks with the stylus. Thank you I so appreciate your input, it is very generous of you. Thank you for your conversation on the 3 items for encaustic. I have been looking for this type of power surge bar for some time and from your article was able to track this one down. You’re welcome, Becky. I’m happy that the posts have been helpful for you. I am a mixed media artist and use many small metal pieces in my projects. I am a newbie with encaustic and wondering if these small metal pieces can be embedded in the wax. If so, do you know of any tutorials that might provide some guidance on how to. Metal is an interesting collage element. If the metal is small, light-weight and thin then it should embed in wax just fine. You’ll want to make sure that the layers of wax are at least as thick as the collage item. For heavier, thicker items you can use screw, glue or sew to adhere it to the panel.